Leave it to the company that invented the minivan to completely redefine the segment. 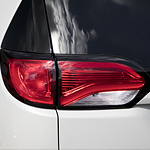 The Chrysler Pacifica is a departure from the minivan fold capturing all of the must-have features of a minivan while extracting many of the stigmatic downsides. The Chrysler design team managed to eliminate the iconic boxy profile for a much sleeker and sweeping design that doesn't look like a spaceship. The styling is anchored by organic and flirty LED headlights and tail lights that nicely tie in the corners of the vehicle while also lending to the car-like appearance. The Pacifica has retained dual sliding doors with hidden tracks and also introduces a ground-breaking handsfree feature that opens and closes the sliding doors with a "kick" under the rocker panel. The "S" appearance package ups the ante of the attractive styling with the addition of black and body-color trim as well as black painted wheels. The styling and access features of the Chrysler Pacifica are a major upgrade to the minivan culture. The experts at WestStar Chrysler Jeep Dodge can help you explore one for yourself.